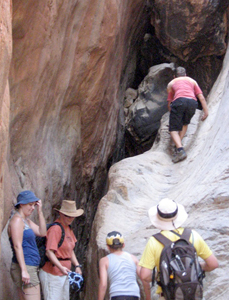 It’s not only the peaceful surroundings that make Standley Chasm an ideal place for a family walk. It’s the fact that kids can climb, jump, chase, hide, seek, investigate, discover and appreciate the attraction of its wild beauty while parents do much the same thing, but at a more, well … ‘parental’ pace. Wearing sturdy walking shoes and carrying plenty of water are essential. The pleasure of a family outing in this particular corner of the Australian outback, only 47 km west of Alice Springs via sealed roads, is that adults can become kids again, and kids can (and do!) guide the adults. Adults of average fitness and kids age 5 and up will enjoy the exhilarating exertion of this walk. 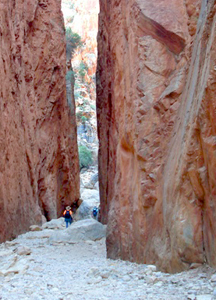 Although it is undoubtedly true that the walk along the riverbed from the car park to the chasm is pretty and that the chasm is best photographed at midday, when the sun lights up the sheer walls to a fiery orange, that is only half the story. The real challenge comes when you climb your way across the rocks behind the chasm. Turn left and you find yourself confronted by a log which will pose no problem for a 5-year-old, but will test the average 40-year-old. It’s worth conquering your apprehensions to join the kids at the top, though, as the scenery is stunning up ahead. As you assess the terrain to come, you see that a rather imposing obstacle, which can only be negotiated by climbing up through a narrow tunnel of rock, is made much more interesting by the fact that to one side of this vertical scramble plunges a narrow, intimidating 4-metre drop. This is where sure-footed 10-year-olds prove to be reliable guides for their adult companions, who may be rather unnerved by these trivial (to the kids!) obstacles. On emerging from this rocky tunnel refreshments are definitely in order to revive anyone over 20. Children might sit still long enough to devour a drink and a muesli bar. The views of red, rocky hillsides covered in spinifex grass, acacia shrubs and ghost gums, set off against a cloudless blue sky, make all the effort worthwhile. Feeling revived by snacks and scenery, you are soon on your way again to join a path which leads back to the car park. By now, even the most energetic 8-year-old should be showing signs of tiredness on the undulating path. Taking frequent opportunities to catch your breath does, of course, have the advantage of giving you time to appreciate the spectacular views afforded by the height of your location. On reaching the second peak on the trail, the panorama richly rewards the death-defying stunts you pulled off to get up here. The river bed, covered in rocks and river red gums, stretches out before you, while in the distance the ridges of the West McDonnells punctuate the arid Central Australian landscape. This harsh terrain paradoxically conveys a sense of peace as you realize that in the face of the powerful forces of nature which created these views, all we can do is stand in awe and admire the beauty. The last leg of the walk is the descent to the car park. On the well-maintained path you may find your muscles aching a bit, and significantly, the children may have stopped dashing ahead. But the anticipation of a reviving cup of coffee at the kiosk makes the remaining distance feel short. You can be sure the kids will sleep well tonight!